Have you seen a 360 photos in your Facebook timeline? If you are using your computer you can drag the picture and look around as if you are in the place. Using high-end mobile devices you can tilt the device to move the picture from left to right. It is like using Google Street View where you can use to see a place in virtual reality. In our previous article, we already explained what is Facebook 360 photos and how to identify if the photo or picture in front of you is a 360 photo. 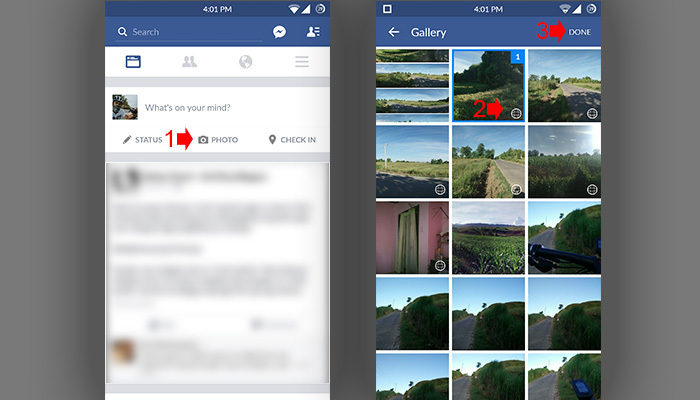 In this article we will teach you how to take a 360 photo and upload in Facebook. Before you can upload 360 photos, you will need a panorama type of picture which you can capture through some apps that you can installed in your mobile device. Facebook did not give specific device device model although they mention in their article using iOS device or Samsung Galaxy phone. Creating this article, I did not use either of that phone mention by Facebook. I cannot give specific phone specs to capture 360 photos for Facebook but base on my experience my old Nexus 4 cannot use to upload 360 photo although can capture panorama picture. If you think you have high-end phone you can try this method that I teach you to take 360 photo. Ok, to take 360 photo using you Android device I will recommend to download Cardboard Camera app from Play Store this app is created by Google, or you can use any 360 camera, such as the Samsung Gear 360, RICOH THETA S, 360Fly, Giroptic 360 Cam or ALLie Camera. Once the app that you selected is installed in your device you can now start taking 360 photo. 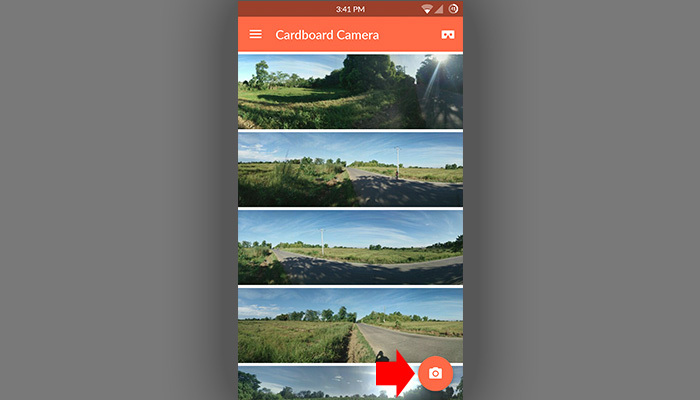 In the steps and screenshots below I use the Cardboard Camera app installed on my OnePlus One Android phone. Open Cardboard Camera then tap the camera button on the bottom right corner of the screen. 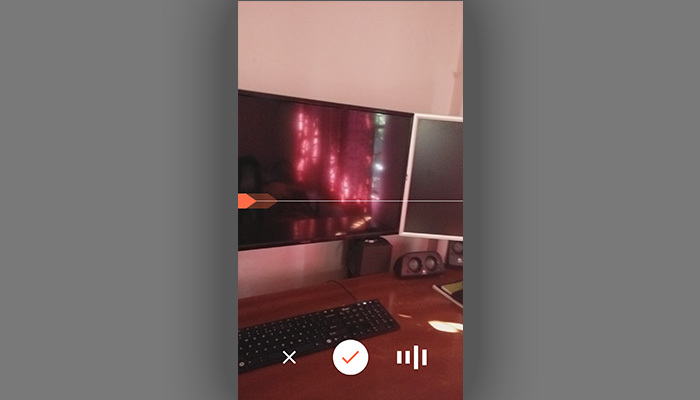 Once the camera is ready tap on the red record button to start your 360 photo recording. Focus your phone around you to take the scene like you are recording a video. You will need to make it slow and steady, once you complete the 360 turn it will automatically render and save in your phone image gallery. Posting or uploading 360 photos on Facebook is easy, its like posting a regular photo or video. Open your Facebook app make sure it is updated. 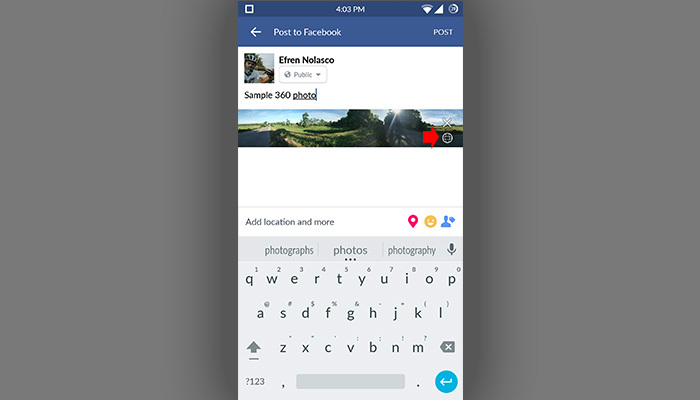 Tap on “Photo” and select the 360 photo that you take, you will notice that panorama photo or 360 photo has a small globe icon on the corner. If you cannot see the globe 360 icon, meaning your device is not supported. It will look like on the screenshot bellow the 360 photo before you post on your timeline, it’s like a flat image but the globe icon still visible on the corner. When you post it to your timeline it will be viewed as 360 photos where your friends can drag and scroll your image if they are using PC/laptop or tilt their mobile phones to look around if it is supported. You have now successfully posted a 360 photo in your Facebook timeline and your friends will enjoy a virtual reality like photo. For more Facebook tips and tutorials visit our Facebook tutorial archives.